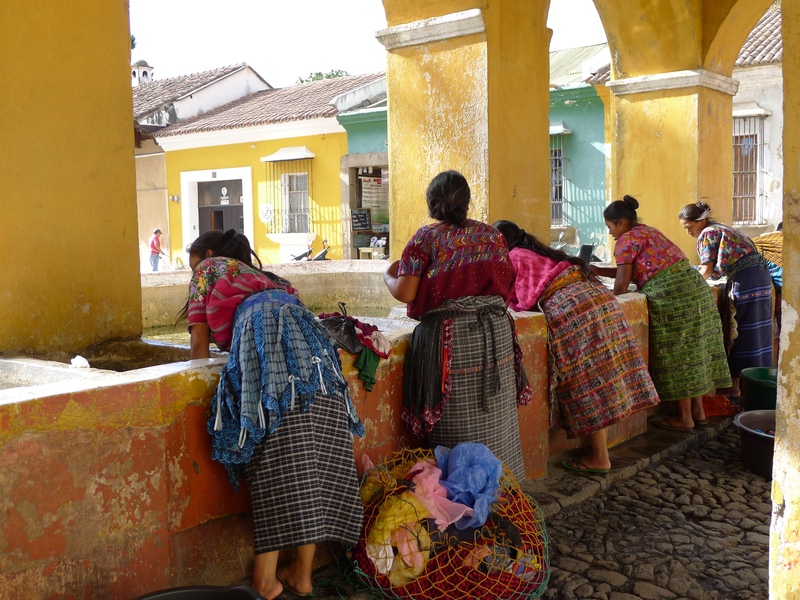 Photo taken in Antigua, Guatemala of local Mayan women doing their wash in town. They came as the sun begins to light up the water and warm up their hands. They carry all their clothing on their backs, scrub and wash it in the water, then place the wet clothing back inside the plastic bags to carry home. I can only imagine how heavy the bags must be with all those wet cloths. But their smiles were as bright as the sun reflecting off the water and colorful buildings surrounding them. I love the colors of the houses and the women’s outfits. Amazing photo! The colors are absolutely fantastic! I love the photos you post, thanks for sharing! Yes aren’t they gorgeous! Apparently every village has their own kinds of colors and patterns. The clothing is in itself a work of art.